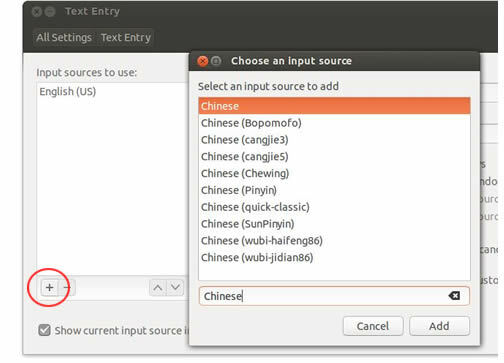 After installing Chinese support in Ubuntu 10 / Ubuntu 11 / Ubuntu 12-17 / Ubuntu 18.04+, you can select and configure input methods. The Pinyin input method supports Simplified and Traditional characters in the mainland standard GB encoding. This IME seems similar to Google Pinyin (and less like Sogou Pinyin now that the apostrophes are gone). 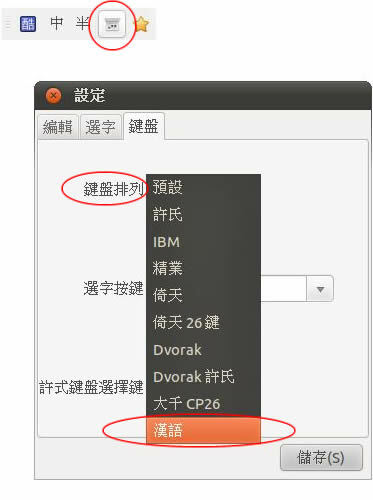 The SunPinyin input method was added as an alternative PRC IME beginning with Ubuntu 11.10. Developed at Sun Microsystems and now an open source project also adopted by the FIT folks, it is SLM (statistical language model) based and may be more accurate. I find it a bit more mature than some. But it too violates Pinyin parsing rules by inserting spaces between Pinyin as you type...and does it yet again by placing no space between "Sun" and "Pinyin" in the name. The Chewing input method offers Zhuyin ("chew-ing", get it?) and Hanyu Pinyin keyboards. Chewing is similar to Microsoft's New Phonetic / Bopomofo IME, but it's more 酷. :-) Long available for Traditional characters in the SCIM and IBus frameworks, in fcitx it can be used for Simplified characters as well. Sogou Pinyin is the most popular Pinyin input method in mainland China on Windows, and is now making strong inroads into the Linux world. It may be more polished, but also tries to sell you stuff. For the latest installation information, see the Sogou for Linux website. Shuangpin is a Simplified character input method that abbreviates Pinyin sounds to two letters. It requires much memorization, but has been around since DOS so clearly some users like it. Most implementations support multiple keyboard layouts. The developers of the Pinyin input method at the top of this list have also released the IBus Bopomofo IME for Simplified and Traditional character Zhuyin input in mainland-standard GB encoding, and the Wubi86 IMEs as well. Non-phonetic input methods like Wubi, Cangjie and Quick are not normaly in my menu, because being "Pinyin Joe" I don't use those. But these are the most popular stroke-based keyboards in the mainland, Taiwan, and Hong Kong respectively. The m17n input methods are included in the Ubuntu 10.04 install but were dropped from Ubuntu 10.10. If you do a clean install of 10.10 or later and still want any of those relatively simple keyboards — like pinyin (m17n), a nifty little Pinyin-with-tonemarks phonetics IME, or the bopomofo (m17n) Zhuyin phonetic-symbols-only IME — you can still find m17n again, as I explain in my FAQ on installing m17n. For Cantonese input methods, use Synaptic to search for fcitx-table-cantonese or ibus-table-cantonese, fcitx-table-jyutping or ibus-table-jyutping, or scim-tables-zh. You may also want to try the CAP IME , which may be more accurate due to the use of the statistical language model, and offers both Jyutping and Sydney Lau input. I have never tried any of those. You can also use CantoInput, which is a free Java app I have reviewed in my survey of third-party apps. As I mention on the fonts page, Ubuntu does include HKCS fonts. Some users still install the SCIM framework in Ubuntu and use the Smart Pinyin (智能拼音) IME instead. This one is very good and quite stable (and similar to Microsoft's MSPY), but I believe development ended in 2005. The Chewing IME (similar to Microsoft's New Phonetic IME) is also available in and SCIM. My Ubuntu 9.04 input methods page contains more information on the features of these IMEs, and I can point you to more information on installing SCIM in Ubuntu 9 and up. As time has gone on, installing SCIM in Ubuntu has become more and more difficult, and I have not kept up with the details, but if you want to try it then hopefully this gives you a place to start. After installing Chinese support with either fcitx or IBus, you're ready to select input methods. • FAQ: Is Ubuntu 17.10 Chinese Input Broken? Then click through the dialogs to select fcitx, logout and login again, and you should see the fcitx menu. In Ubuntu 15 and 17 select "ConfigureFcitx" on the language keyboard menu. Do not use the "Text Entry Settings" panel for this setup. It will interact with fcitx later, but not now. In Ubuntu 16 this was "Text Entry Settings". For screen shots and instructions, skip to the next section below. In the Input Method Configuration panel, at the lower left click the "+" sign. Then in the Add Input Method panel, deselect "Only Show Current Language". Set preferences by clicking the wrench-and-gear icon at the bottom of Input Method Configuration. This will take you to the preference settings for each input method. For example, you can turn on fuzzy Pinyin in SunPinyin, or change from Zhuyin to Pinyin in Chewing (see "Using Pinyin in the Chewing IME" below). You can also use the arrows in that same area to sort order input methods will appear on the menu. In Ubuntu 16 select "Text Entry Settings..." on the fcitx language keyboard menu. In the Text Entry panel, click the "+" button on the lower left. This will open the "Choose an input source" list. 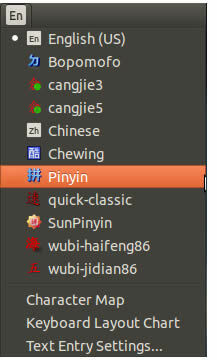 The input methods available here by default are Chewing, Pinyin, and SunPinyin. (Most of the other input methods listed above can still be added to your system.) The one named "Chinese" is the Latin keyboard for the China region; most of us can skip that. Ubuntu 16 Input Method Preferences can be accessed via the tool buttons at the bottoms of the Text Entry and Input Method Configuration panels. 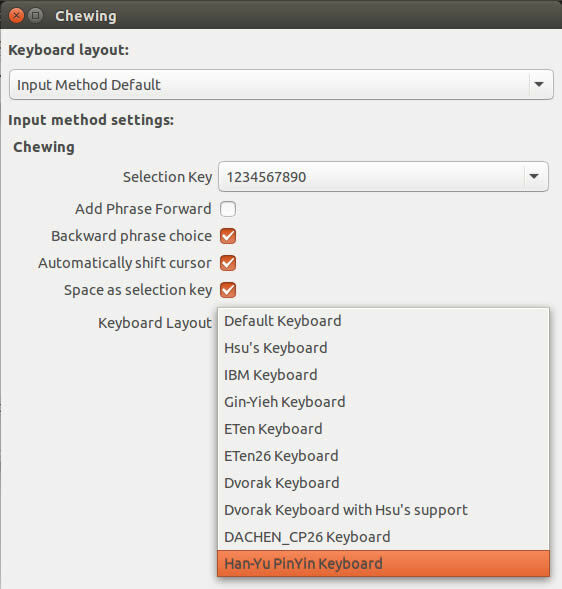 See below for more detail on using Hanyu Pinyin in the Chewing IME and preferences for the Pinyin IME, after my sections on choosing input methods for earlier versions of Ubuntu. In 13.10 - 14.10, go to the language menu and select "Text Entry Settings". You can also use the Dash to search using the words "Text", "Text Entry", or "Language" to find Text Entry. In the Text Entry panel, click on the "+" button at the lower left. Then in "Choose an input source" type "Chinese" in the search box, click on a selection, then the "Add" button. Repeat as needed. These can be sorted to appear in your language menu in whatever order you wish, using the arrow buttons at the bottom of the resulting list in the Test Entry control panel. 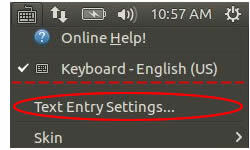 In 12.04, 12.10, or 13.04, click on the keyboard icon at the top of your screen and in the menu select "Preferences". Beginning with Ubuntu 11 you can also search via the Dash (or Ubuntu/Windows key) in the Application Lens for "Keyboard" or "input". In Ubuntu 10 this is also under System > Preferences > Keyboard input methods. 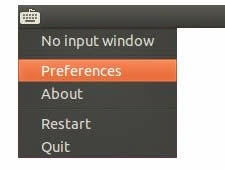 In Ubuntu 12.04, 12.10, or 13.04, this will take you to IBus Preferences where you need to click on the second tab, "Input Method", and click on the "Select an input method" menu. 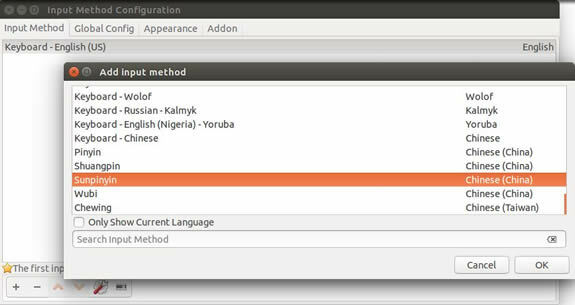 Ubuntu 12 introduced only small changes and is still very similar to the following screen shots, but you'll need to check a box next to a new "Customize active input methods" option before you can edit IBus Preferences. Scroll down to "Chinese" select the input methods you want, and click the "Add" button. Please don't forget this next step in 12.04, 12.10, or 13.04, even if everything seems to be working fine: when you make a change in IBus Preferences, I recommend that you always click on the keyboard icon and select "Restart". The keyboard disappears and reappears, and now we're ready to configure your input method input methods. Later versions don't have this issue; in fact, they don't even offer "Restart" in the menu. Before 13.10, you would see the message "No input window" in the menu if your cursor was not inside a document. This also happened if IBus was not working properly, regardless of where you clicked. If you find yourself in the latter situation, you may need to try dropping into Terminal and entering im-switch -s ibus or you may need to try other methods of restarting, reinitializing, or reinstalling IBus that have been posted on Ubuntu Forums and elsewhere. I have not seen this happen in recent releases. The Chewing input method offers Hanyu Pinyin in addition to several flavors of "Bo Po Mo". 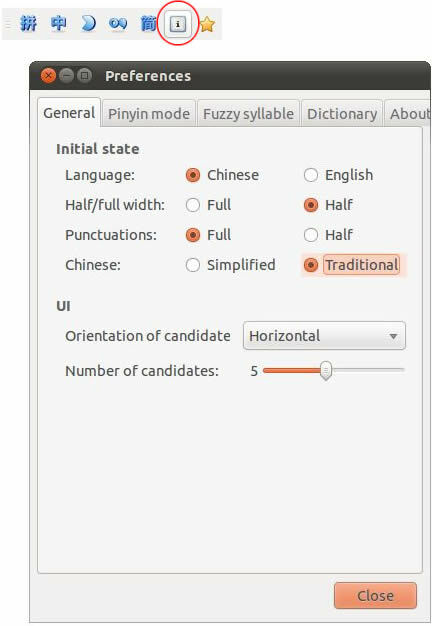 This input method is similar to Microsoft's New Phonetic / Bopomofo IME: you can type Pinyin with tones numbers, as in "Han4", to narrow the number of candidates. Always a Traditional character input method, in fcitx you can also select Simplified character input on the language keyboard menu. In Ubuntu 15 and later (except 16, see below), from the fcitx language keyboard menu, select ConfigureFcitx. In the Input Method Configuration panel select Chewing, then click the preferences icon. In Ubuntu 16, while in the Text Entry panel, click the tool icon and that will open the Input Method Configuration panel. Or, from the fcitx language keyboard menu, select ConfigureFcitx. In the Input Method Configuration panel select Chewing, then click the tool icon. 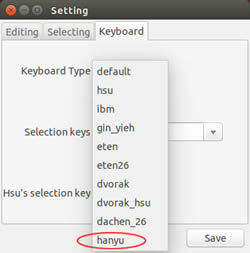 Then in the Chewing preferences panel, open the Keyboard Layout menu and select the Hanyu Pinyin keyboard. Close the panel, and you're done! 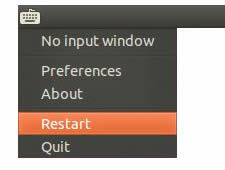 In most previous versions since Ubuntu 12.04, Chewing IME preferences are accessved via the Settings button in the floating Language Panel. The Settings (設定) panel was entirely in Chinese until the 14.10 release. Click the third tab, Keyboard (鍵盤). Then click the first drop-down menu, and select the last item in the list: Hanyu (漢語). Click the Save (儲存） button, and you're done! In 13.10 the floating language panel was missing, but it returned in 14.04, and appears whenever you place the cursor in a document or other text entry area. 14.10 also introduced a Settings item in the language menu, as you can see on the left here. By that version the Settings control panel was again available in English, where you can simply go to the "Keyboard" tab and select "hanyu". Feel free to click around in this Settings panel and experiment with other configuration options for the Chewing IME. Beginning with Ubuntu 16.04, the fcitx menu includes a Simplified / Traditional selection option, as you can see in the screen shot here. This 汉/漢 option is available for all the input methods that support it. In this example, I have loaded and tested Chewing, Pinyin, and SunPinyin. 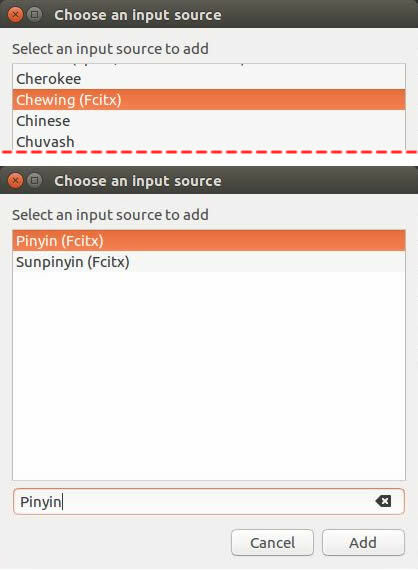 In Ubuntu 15.04 and 15.10, this feature was not available in fcitx, so the only way to get use the Pinyin IME in both Simplified and Traditional characters was to install the Ibus version instead of fcitx. In the IBus version of the Pinyin IME, You'll find a 简/繁 button right on the floating language panel for quickly toggling between Simplified and Traditional. Ubuntu 14.04 introduced a 简/繁 option just above Preferences on the Language menu. In the Preferences control panel, you can change the default state from Simplified to Traditional, and there are several other options to play around with in there as well. In Ubuntu 13.10 the floating language panel was missing, but it returned in 14.04. Note the 简/繁 (Simplified / Traditional) button right there.